Former WWE wrestler Eddie Guerrero's name re-surfaced on WWE's website today as part of a story on Vickie Guerrero paying tribute to her late husband at WrestleMania 26 when she attempted a frog splash during the ten-Divas tag match. "I definitely wanted to do something for Eddie," she said. "I started thinking about it during training, when I was learning to get on the ropes. The really great thing is the same ring I was training in in El Paso, Texas, is the same ring Eddie grew up with in his backyard." Read the full story on WWE's website. Caldwell's Analysis: It was odd at WrestleMania for Rey Mysterio - a babyface - and for Vickie - a heel - to both pay tribute to Eddie. They were each trying to get heat in their own way while incorporating Eddie's memory into WWE's biggest show of the year, but it was an odd tone to set. 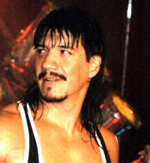 Do fans boo Vickie for paying tribute to Eddie, who was beloved by fans? It's understandable she would pay tribute to him, but it was still odd. Eddie photo credit Mike Lano.